The Daily Mail was among several news outlets under fire last night after mistakenly reporting that Amanda Knox's appeal against her conviction for the murder of Meredith Kercher had been rejected and the original guilty verdict upheld. The Mail found itself at the centre of the controversy after its website Mail Online not only reported a guilty verdict for Knox and her former boyfriend Raffaele Sollecito but published a prepared story that purported to detail the reaction of those in the court room and quotes from prosecutors. Several other news organisations also jumped the gun: the Sun published a prepared "guilty" story, the Guardian initially reported in its liveblog that the appeal had been rejected, and Sky News initially reported a guilty verdict. The confusion arose after the judge began his statement by returning a guilty verdict for a charge of slander against Knox – over accusations she levelled at local bar owner Patrick Lamumba. He went on to announce that the murder conviction had been overturned but, having heard the word "guilty", several news organisations rushed to publish. The story published by Mail Online included a detailed description of a scene that might have followed the anticipated guilty verdict. "As Knox realized the enormity of what judge Hellman was saying she sank into her chair sobbing uncontrollably while her family and friends hugged each other in tears. "A few feet away Meredith's mother Arline, her sister Stephanie and brother Lyle, who had flown in especially for the verdict remained expressionless, staring straight ahead, glancing over just once at the distraught Knox family. "Prosecutors were delighted with the verdict and said that 'justice has been done' although they said on a 'human factor it was sad two young people would be spending years in jail'". 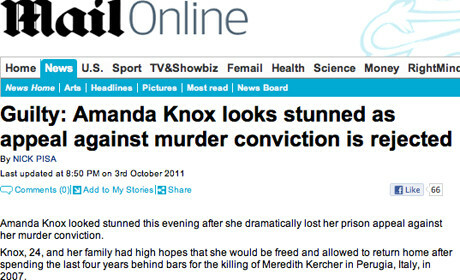 This morning's print edition of the Daily Mail reported on the confusion over the verdict, acknowledging that it "caused some to initially think that [Knox's] conviction for murder had been upheld", but the report did not mention the newspaper's own error online. The Guardian, which also reported a guilty verdict but no additional details in its liveblog, issued an apology an hour after the mistake: "Now that the initial focus on the ruling has passed, it's time for a proper apology from this end for getting it wrong earlier in saying that the the Knox and Sollecito appeal had failed. "We were too quick to run with our initial understanding of the ruling, as it was being translated, but as soon as we realised the mistake it was corrected immediately." Blogger Malcolm Coles, who was one of the first to spot Mail Online error, said last night: "I'm not sure it gets more embarrassing than this for a news site ... At the sound of the word 'guilty', they hit publish on a story about her appeal being rejected that includes reactions from the family and prosecutors being delighted - reactions that can't have happened as she was found NOT guilty of murder." Associated Newspapers, publisher of the Daily Mail, had not responded to a request for comment at the time of writing.